Black Ship and Dillon Gallery are pleased to present Armchair Parade, an immersive and vastly interdisciplinary installation created by theater and opera designer-director Julian Crouch (Shockheaded Peter, Satyagraha), composer-musician Mark Stewart (Bang on a Can All-Stars, Paul Simon), filmmaker Ragnar Freidank (The Beautiful Hills of Brooklyn) and scent sculptor Christophe Laudamiel (Garden of Addiction, Bedaguer & Pejus). Spanning Dillon Gallery’s ground floor and lower galleries, the work will remain open for over six weeks, February 13 - March 30, Fantastical from Feb 13 – March 8. Although the work cannot be seen or heard until one descends into Dillon Gallery’s vaults, visitors begin experiencing Fantastical 2014, Laudamiel’s contribution to Armchair Parade, as soon as they enter the building. The pioneer of scent-as-fine-art, Christophe Laudamiel, whose first solo gallery show Dillon presented to acclaim in 2012, is constructing numerous “smell sculptures” that will fill the first floor. Laudamiel’s “septology” of seven scents—including “Roasted Piglets,” “Bay Horse,” “Sunbathing Devils,” “Frog,” and “Feathers & Fur”—are based on the characters and themes that feature visually, sonically, and tactilely downstairs. Fantastical 2014 represents Laudamiel further exploring cross-disciplinary collaboration, which he has previously undertaken in Green Aria —a ScentOpera with music composers Nico Muhly and Valgeir Sigurdsson, at the Guggenheim—and other works. Fantastical 2014 is on full display Feb 13 – March 8 at Dillon Gallery. In Dillon’s lower gallery, one enters a whimsical living room populated by a mix of eccentric characters. Sitting alone or in small groups, puppets created by Crouch gather around vintage television sets, isolated in their own worlds, but unified by their shared pastime. 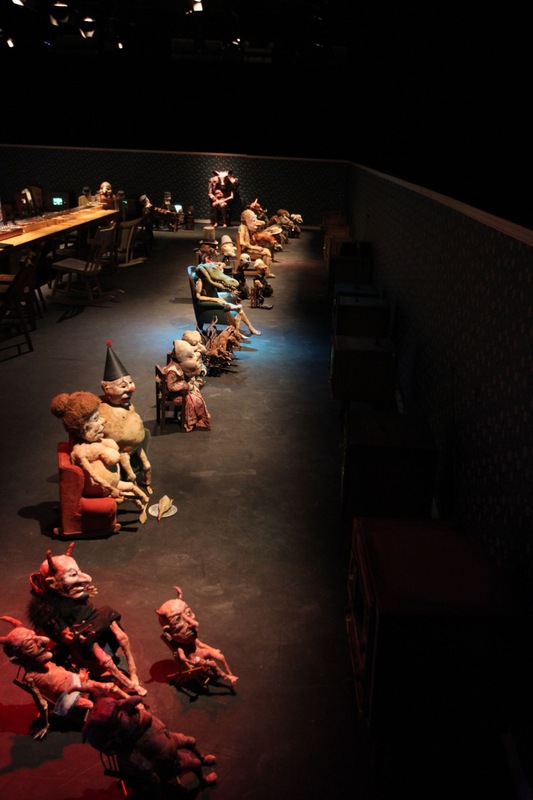 On the screens they watch films created for Armchair Parade by Ragnar Freidank, which depict the puppets’ lives. It is as if they are watching themselves on a sort of reality TV for mythical creatures. The Big Boing—a handmade, 24-foot lamellophone created by Mark Stewart from mixed materials and objects found on the streets of New York City—creates the soundtrack to the creatures’ lives. Resembling an oversized African mbira, the instrument stretches down the center of the room and can be played by audiencesArmchair Parade was developed, in part, in a Fireworks Residency at BRIC House, a new arts and media complex in downtown Brooklyn. A previous version of the work was shown as part of that venue’s opening programming in October 2013, and was extended due to popular demand.